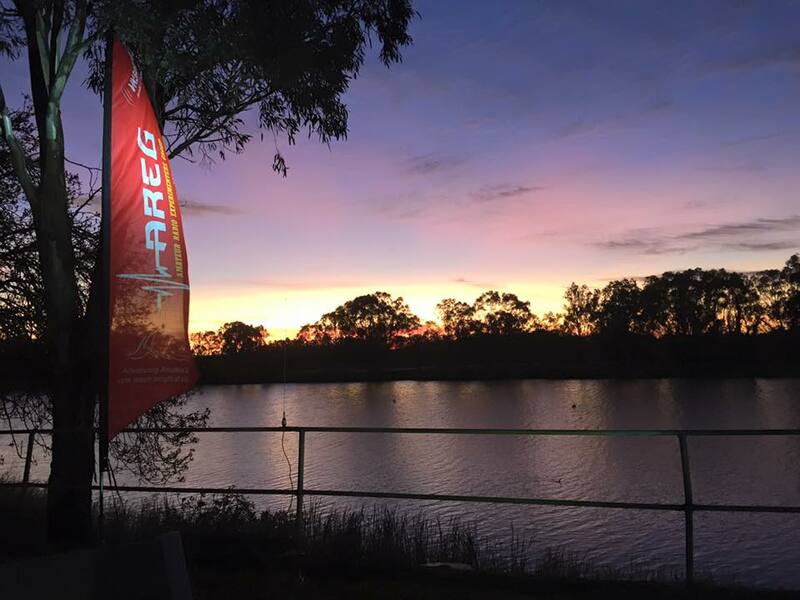 The RPM200 is a community event run each year along the Murray River from Berri to Morgan in South Australia. Over 120 canoes and 140 paddlers take part in various versions of the event spanning 35, 50, 100 and 200km distances over the three days. This is an endurance race in the middle of winter, often with paddlers spread out over up to 30km of the river at a time. Monitoring the welfare of everyone involved and helping those in need when called requires an extensive communications network. 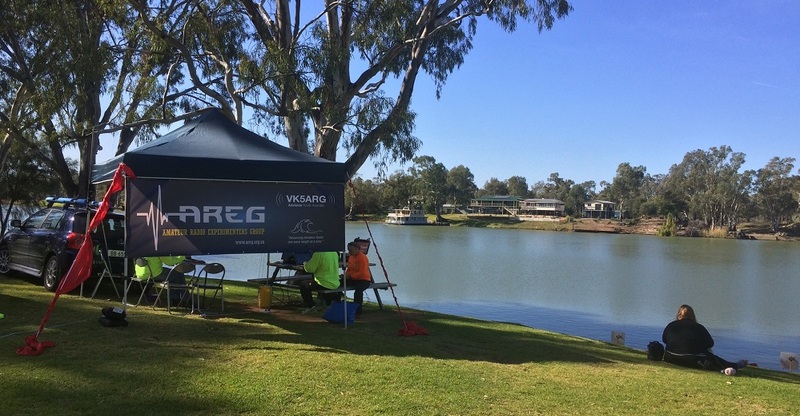 The combined Amateur Radio Experimenters Group (AREG) and Riverland Radio Club (RRC) became involved with this event after AREG was approached directly by the Marathon Canoe Club of SA in 2014. Following that invitation, we set about designing a radio network to cover the 20 land based check points, 4 boats, 2 medics and the race director, and then provided an army of volunteers to run it all. The network consisted of a mix of 2m and 70cm Amateur VHF/UHF voice and APRS stations as well as a 164MHz commercial network to facilitate communications from the non-amateur event assets (such as the safety boats). From AREG’s perspective, it was a great way to give something back to the community from our hobby, but also it provided a very interesting platform for carrying out various networked radio experiments. So, how do it all play out in 2015? Read on to find out! 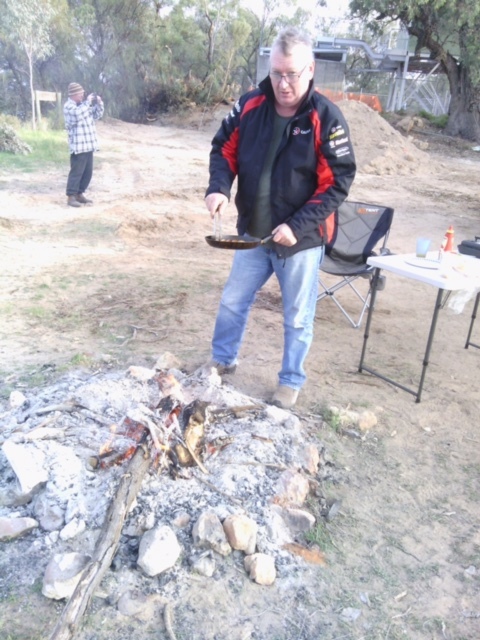 Day 1 – Berri to Moorook – Foggy then Fine! Highlights of the first day included a very early and foggy start across much of the river. The paddlers on Day 1 Depart Berri, from where they paddle downstream. Matt VK5ZM and Josh VK5JO drew the short straw this year and manned the start at Martins Bend. The first major hurdle is traversing Lock 4. Considering the temperatures and conditions battling the cold is a serious issue we have to contend with during this event. AREG staffed the lock with 4 operators, Andy VK5AKH, Dennis VK5FDEN, Paul VK5JG and Scott VK5FSKS while Scott VK5TST and Grant VK5GR ran the opening COMMS net control from a hill overlooking Lock 4. Downstream at Loxton, the Riverland Radio club team consisting Ivan VK5HS, Peter VK5FLEX, Rob VK5MRE and Grant VK5GR from AREG helped run the M100 Start line where roughly an additional 60 paddlers entered the race for the 100km challenge. Meanwhile back at Moorook, the AREG COMMS team ran net control from the finish line. Other members including Mark VK5QI and Gary VK5FGRY ran the checkpoint at Pyap while Ben VK5BB and his wife Olga, plus Loius VK5FLY and Rob VK5TRM from the Riverland radio club ran the MiniMarathon start line at New Residence. Josh VK5JO, Matt VK5ZM, Andy VK5AKH, Scott VK5TST, Grant VK5GR, Paul VK5BX and most importantly Peter VK5KX with helo from others built and operated the primary net control at Moorook. Peter’s bus made an excellent radio comms base and it’s facilities were very much appreciated by all involved! The other critical activity is of course feeding the troops. The AREG crew however was at no risk of going hungry as the Sharon VK5FSAW catering team was on hand, assisted by Irene (VK5AKH’s mum) and Amelia (Sharon and Grant VK5GR’s daughter). Lunch boxes for 20 were made each day with cake and sandwiches and Saturday dinner was a hearty beef stew with apple crumble for desert. The food was widely praised by everyone! 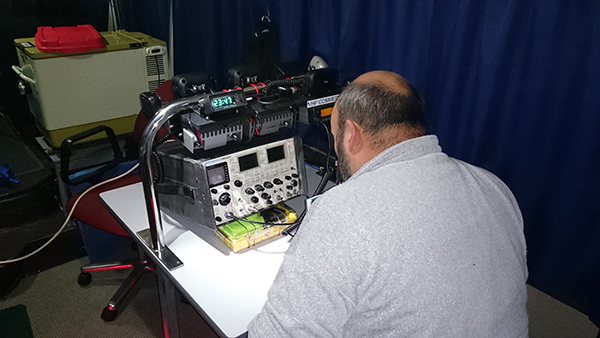 We did also have to break out the mobile AREG radio repair lab. Matt VK5ZM toiled late into the night the Friday before the event tuning radios! Day 2 began with more early starts. 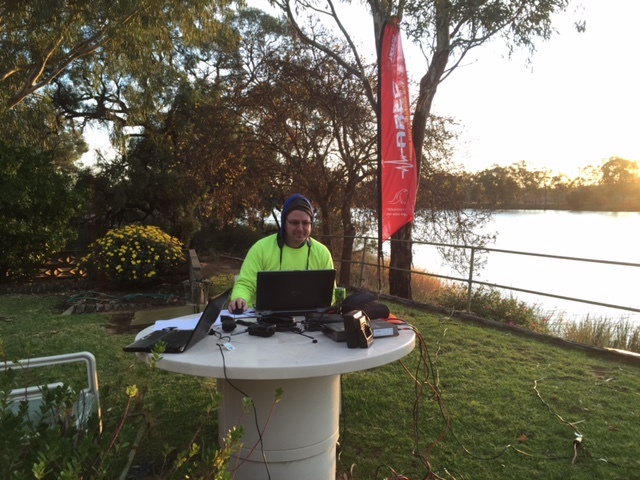 Net control started at sunrise from the banks of the river at Kingston on Murray run by Scott VK5TST and Grant VK5GR. It also doubled as Checkpoint E9. Meanwhile, Mark VK5QI and Gary VK5FGRY attended the start back at Moorook. Matt VK5ZM lead the lock crew of Bob VK5FO, Ben VK5BB and Ben’s wife Olga at Lock 3 while Rob VK5TS from RRC staffed Wigley Flat with his wife Sandy. Ivan VK5HS teamed up with with Peter VK5FLEX, Andy VK5AKH and Scott VK5FSKS to run the Devlins Pound M100 start checkpoint. Peter was truely dedicated as he actually camped out at Devlins Pound overnight! The next checkpoint was run by Mark VK5QI, Gary VK5FGRY, Louis VK5FLY and Ron VK5TRM while the finish was staffed by Chris VK5CP and family. Net control had a number of people rotate through during the day including Peter VK5KX and Josh VK5JO. Again everything ran smoothly, with one small wrinkle when the power supply for one of the course safety boats failed (blown fuse). Mid course repairs were effected thanks to Paul VK5BX who met them at one of the intermediate checkpoints with the spares to restore service. 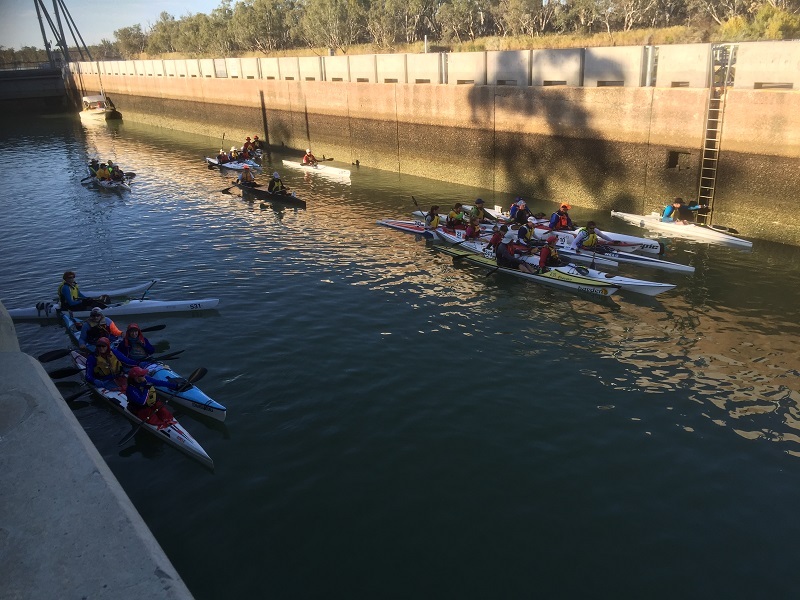 Day 3 saw the paddlers start before Dawn from Waikerie. Net Control was online from 5.30am overlooking the river from the cliffs west of the town thanks to Andy VK5AKH and Grant VK5GR. Dennis VK5FDEN and Paul VK5JG manned the start while Scott VK5TST manned the Sunlands checkpoint. By sunrise, the paddlers had made it to Lock 2, the last of the lock transits for this year. The lock crew this time consisted of Matt VK5ZM, Bob VK5FO, Chris VK5CP and Leena VK5FUNN. Unlike Day 2 there were no holdups at the lock and the race progressed efficiently through this stage of the event. After Lock 2 the paddlers proceeded down river to Hogwash Bend. Here we had to perform some emergency repairs to one of the medic car commercial VHF radios which had failed. 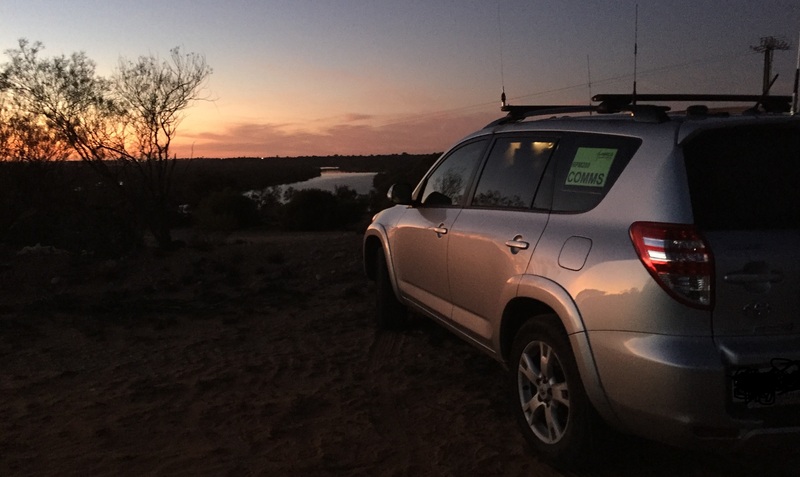 Once that was replaced, the combined Riverland Radio Club and AREG teams successfully oversaw the start of the 100km Day 3 event. Starters Gun Fires for the M100! Molo Flat was the next checkpoint staffed by Mark VK5QI and Gary VK5FGRY while the Mini Marathon Start was managed by VK5BB and his wife Olga, VK5TST and VK5JO. The comms centre for Day 3 was located on a hill overlooking the Cadell Ferry. This location was chosen to provide good VHF coverage of the river from Lock 2 through to the finish line. Principle staffers today were VK5BB, VK5KX, VK5BX, VK5ZM and VK5GR. The final checkpoint was E20 in Morgan. Andy VK5AKH and Scott VK5FSKS were the principle operators at the finish. At the end of the day all of the paddlers had been accounted for, and of the incidents closed out. All of the VHF Commercial and 147/438MHz Amateur network had been deployed and then recovered and most of all, the organizers were very happy with the service that AREG, RRC and the amateur radio operators who participated provided to support this event. The feedback received was that this event has achieved an extra level of safety through the communications capabilities and skills that Amateur Radio has been able to bring to the community. A great demonstration of the value of Amateur Radio and it’s relevance to today’s society! The AREG radio communications team organizing committee would particularly like to thank all of the members and their families of AREG and RRC who participated in this event. Without your efforts not only during the event but in the many weeks leading up to it, the communications network would not have achieved the quality that it did. A special thank you to Matthew VK5ZM is also in order who lead the organisation of the event for AREG and who undertook the principle liaisons with not only the Marathon Canoe Club but also the many other support and official organisations required along the way.